His House > Blog > Detox > Can I Detox from Alcohol on my own? Can I Detox from Alcohol on my own? You have an alcohol problem. Maybe you’ve known it for some time, or maybe you’ve gotten the message when you crashed your car while under the influence, or maybe got arrested for DUI or DWI. Maybe you’ve gotten into arguments with loved ones over your drinking, or maybe you failed a drug test at work because of the amount of alcohol in your system. Whatever happened, you’re looking into alcohol detox and wondering if you can detox from alcohol on your own. Alcoholism is a fairly common disease, affecting 17 million adults in the United States in 2012, or a little over 7 percent of adults. Add to that the 855,000 adolescents who were diagnosed with alcoholism, and you can see that it is a problem for our nation. Even though it is fairly common, when considering substance abuse, alcohol is still a drug. Alcoholism must be treated like a disease and those who suffer from it must go through detox or will risk withdrawal symptoms. If you’ve been addicted to alcohol for some time, chances are you’ve tried to cut back, but without success. Maybe you’ve tried to go “cold turkey,” only to have the alcohol withdrawal symptoms which can be quite serious. 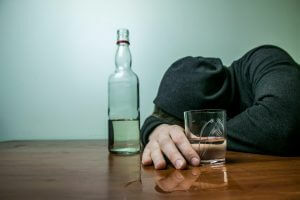 You see, your body has come to depend on the alcohol, and removing it can cause some serious alcohol withdrawal symptoms which can be more than just unpleasant — they can kill you in extreme situations. That’s why it’s important to detox from alcohol carefully. If you drink regularly, chances are you are more likely to develop withdrawal symptoms. Withdrawal symptoms are likely to appear about eight hours after your last drink. They often get their worst between 24 to 72 hours, but some people have had symptoms for weeks afterward. Some people get such extreme alcohol withdrawal symptoms called delirium tremens or the DTs. These can be very dangerous. That’s why you should not detox from alcohol on your own. Alcohol detox at a rehab center works by minimizing your withdrawal symptoms while you no longer use alcohol. Minimizing the effects makes detox from alcohol less unpleasant for you and keeps you safe from the effects of delirium tremens. Detox is the first stage on your road to recovery. While detox allows you to finally lose your dependence on alcohol, your mind still craves it and therefore you need treatment for your addiction. Working to rid yourself of your addiction is important to getting your life back. Imagine getting your life back and doing the things you want to do, instead of being drunk, or cruising through life on a maintenance dose of alcohol.